I am here to talk about getting new bike lanes in front of my school. My school is Nightingale Middle School. I remember you came to my school 3 weeks ago. 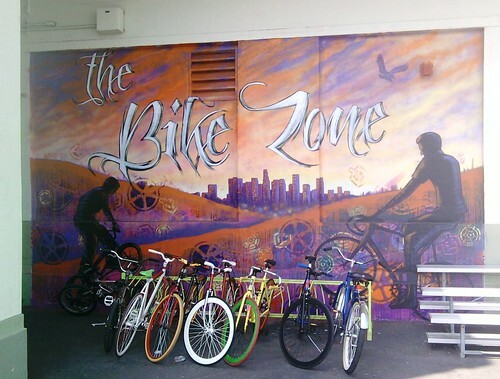 The LA City bike Plan of 2010 states that bicycle lanes of Ave 28 and Cypress Ave will be added. The reason why we need bike lanes is because there are kids in this area that are overweight or obese. Kids can get exercise while riding their bikes home and lessening the risk of obesity. Please do as much as you can in your power to support these bike lanes. Awesome! 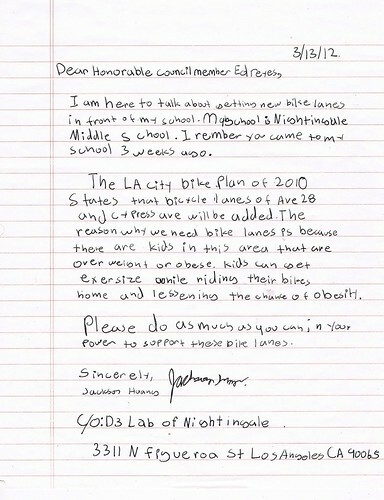 We were excited to see a local kid getting involved in the work of making our streets safer and better for bicycling. We look forward to the new lanes on Cypress Avenue and Avenue 28 – which connect with Figueroa Street, which will someday also be safer for bicycling and walking through the #Fig4All campaign.